The Windows XP OS, released in 2001 has been an extremely popular platform for personal users, universities, retail banks, government institutions, and ATM operators. This is due to its ease of use, security, and stability. However, security support for Windows XP ended this April. While most personal users and small/medium businesses have moved on to newer systems, about 90% of ATMs still use XP. As ATM operators begin to upgrade to newer software (mostly Windows 7), they will also need to upgrade their hardware to the 2010s-era, not the 2000s-era hardware they currently run on with XP. This is where Intel comes in. According to Retail Banking Research in London, there are approximately 200,000 ATMs in the United States that still use XP. Although many banks have started to make the shift towards newer Windows systems, many have elected to pay Microsoft to continue producing security updates (most contracts are for 1 year). In other words, the opportunity to ride the wave of hardware system updates is not over. Why Intel and not AMD or Microsoft? Microsoft, while a great company, derives only 10% of its revenue from the Windows Operating system. Most revenue comes from Microsoft Office and Windows Server. Simply put, you need a big % change in OS revenue to make a significant dent in the overall price of Intel stock. Furthermore, this news is most likely already built into the stock price. Why Intel over AMD? This comes down to company valuation and preference for ATM operators to go the Intel route. 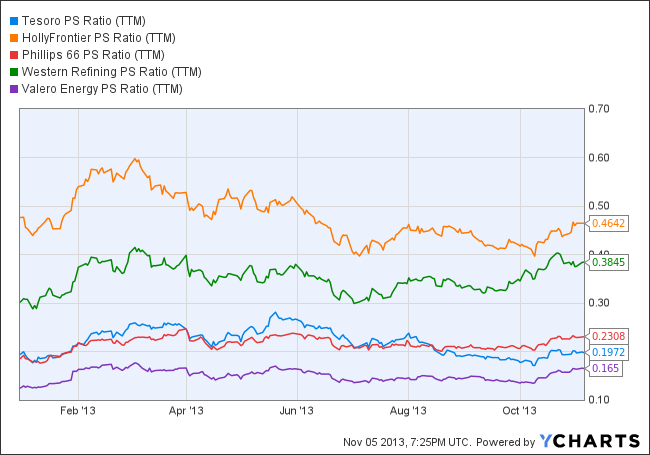 AMD is already trading at a P/E ratio of 89.38 with a 1y forward P/E estimate of 18.65. Intel's same numbers are 14.94 and 13.96, respectively. As you can see, investors aren't expecting much growth from Intel. It has been easy to trade since late last year. Barring regular company events such as dividend announcements and quarterly reports, Intel has been following a nearly perfect technical pattern since its 52-week low last August (see chart below). 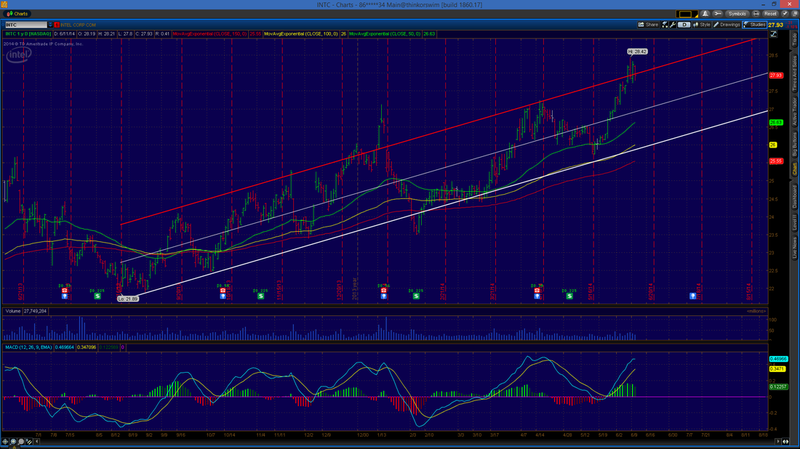 Traders who buy near the bottom of the regression channel and sell near the top will have made a significant profit. The regression channel runs from the August 2013 low to March 4th, 2014 (the first time I made the study) and haven't changed it yet. 6. While the trend described in (5.) will certainly not go on forever, traders should find comfort in knowing that Intel is a stable company and long-term prospects are encouraging. 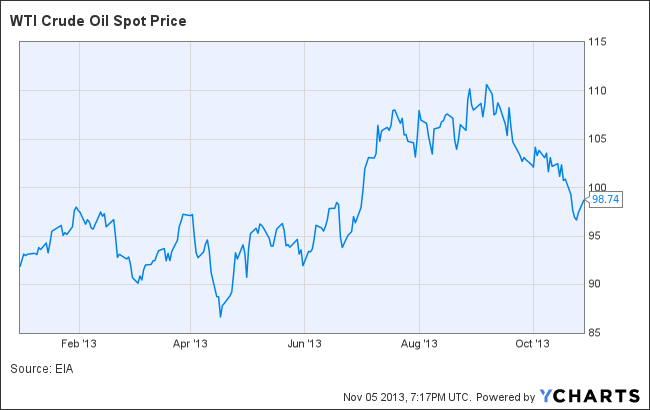 So with a YTD return of over 8% versus less than 4% for the NASDAQ composite, is Intel still a great buy? Yes. With a low P/E ratio for the industry and reassuring growth prospects over the next 12- to 18-months, the price certainly doesn't match the potential. Oh, and for all of you dividend buffs out there, it pays a hefty 3.30% yield. Start buying around $27, but save some cash for if and when it drops below $26.50. Universal Display Corporation $OLED - This year's biggest winner? "It seems like new cell phones are released every month with marginal improvements. Furthermore, it appears that most new technologies are bought from small companies, not created by the big guys at Apple and Samsung. What's going to be the newest mass-produced technology and from what company will it come?" The company’s core technology projects can be broken down into 4 categories: PHOLEDs, TOLEDs, FOLEDs, and WOLEDs (don’t worry… descriptions to come). Perhaps the company’s most important product for near-term consumer electronics devices is their PHOLED, or Phosphorescent OLED technology. A central theme in mobile electronics over the past few years has been minimizing the overall profile of the devices. A fundamental roadblock to this theme has been the conflict between the growth in size of cell phone displays and the limited capacities of lithium-ion batteries. PHOLED focuses on the former-half of this conundrum – reducing power consumption. Universal Display’s PHOLED technology consumes about 150mW of power, versus about 325mW for a traditional LCD screen and about 375mW for an OLED screen (based on a 4” diagonal display). Not only does this help with power efficiency (possibly allowing for a smaller battery), the reduced profile of the actual PHOLED screen will help electronics manufacturers continue the trend of thinner profiles. Universal Display’s TOLED (transparent OLED) technology, which is still in early stages of design, provides the user with a screen that is nearly as clear as the glass or plastic substrate when powered off. While this technology is certainly further off from mass-commercialization, it is reassuring to know that the company has more ammunition than its basic OLED technology. A more appropriate solution to near-future consumer technologies (did someone say iWatch?) is the FOLED technology (the ‘F’ stands for “flexible”). This is exactly what it sounds like – OLED technology on a flexible substrate. As Google, Apple, and Samsung continue to tout their new “wearables”, there appears to be an apt suitor for their curved display challenge. Finally, Universal Display’s WOLED technology (white OLED) is a product of the company’s PHOLED technology. It provides an alternative to the standard incandescent and fluorescent bulbs, providing more than twice the power efficiency of an average fluorescent bulb. The US Department of Energy initiated a program in 2000 to fund the research and development of inorganic LEDs and OLEDs as prospective next-generation lighting sources. Since then, the company has gone from 20 lumens per watt to 102 lm/W (compared to 12 lm/W for incandescent and 40-70 lm/W for fluorescent). Their goal is to reach 150 lumens per watt before fully licensing the technology. While initially skeptical of Universal Display’s use of the “design and license” business model, I’ve come to believe that it will work well for the foreseeable future. There are two main reasons for this: First, the company has a whopping 125 employees worldwide. This means that their strategic advantage lands squarely in the “designing only” realm, especially because many large electronics assemblers already retain the necessary infrastructure to efficiently mass produce the technology created by Universal Display. The company gets its intellectual property from three sources: in-house, sponsored University research, and Motorola, Inc. Universal Display’s more recent patents have come from in-house and company-sponsored University research, with the most recent patent from Motorola completed in early 2002. From a revenue standpoint, the company is trading at valuations well below its 3-year average P/S ratio of 31.61 at its current level of 7.1. While still an extremely rich valuation, its current price may present an attractive entry point, especially considering the company’s 1Q2014 performance and explosive revenue growth. Although the company has provided positive accounting profits over the past 4 quarters, it has struggled to remained FCF positive in 4 of the past 8 quarters. This has caused Universal Display to burn through over $100 million over the past 2 years, $35 million of which occurred in 1Q2014. While most companies have discrepancies between accounting profits and FCF due to depreciation and prepaid expenses, Universal Display’s discrepancy comes from ballooning account receivable – up to $24.51 million from $10.53 million the same quarter last year. Look for this number to stabilize in future quarters, or at least remain in-line with revenue growth. "Everything seems to be going on sale today. Are you buying?" "After reading this article, do any Chinese Banks or Russian energy companies come to mind?" The first thing I should mention is that I absolutely do not recommend purchasing stock in any of the companies he mentions in this article. Important fact #1 about China – there is no market – emerging or developed – that is more prone to bank runs than China. The Chinese government has an “implicit” guarantee that it will bail out banks if they are at risk of failure due to a bank run. By “implicit”, what they are actually saying is “I want to give your customers a certain level of assurance, but should there actually be a bank run so horrible that you are at risk of shutting down, we will sit down and decide if we want to screw you over or not”. There was a rural bank in China that had a 3-day run before the Central Bank stepped in and said “your deposits are protected”, and things calmed down. Did they actually do anything other than say “everything is going to be okay”? Nope. Would they have done something had the bank run continued? I guess we’ll never know, but my guess is they would have let it die. So why do bank runs have anything to do with valuations on a Chinese financial institution? Because they are related to this “super-safe” reserve requirement that the author refers to. The number, to be exact, is 20% (slightly higher for large banks, slightly lower for smaller banks). Basically, for every $1 the bank takes in, they can lend out $0.80. The rest must be kept either in the bank vault or on deposit at the central bank. The problem with this what the Chinese euphemistically refer to as “Wealth Management Products” or (WMPs). These WMPs have ballooned to approximately 10 trillion yuan (4Q2013) – more than double since the same time 2 years prior. WMPs are advertised by banks as high-yield accounts and work like this: The bank depositor wants a higher yield, so the bank recommends investing in riskier loans to generate higher yields. However, due to strict banking laws, most Chinese banks are not allowed to hold certain loans on their balance sheets below certain credit levels. To get around this, “trust companies” were invented to take these customer deposits. These trust companies pay a commission to the bank for advertising their services, then invest the money in junk-grade debt. How do they do this? The bank either originates “risky” loans and sells them to the highest-paying trust company to keep them off its balance sheet or the trust lends the funds directly to the company. The company (receiving the money) then deposits that money at a bank, invests it in their newest project, or (interestingly enough) reinvests them in a WMP to complete the process again for a different company. When there is money from one place loaned to another place to be reinvested back in the same place again (and repeated over and over again) you have what we call a house of cards. As property values continue to increase in China (the author mentions that Beijing prices have quadrupled), property owners can continue to borrow against these increases. If this whole “sell subprime loans to investors because property values just continue to go up” thing sounds familiar – it’s because that’s exactly what happened in the years leading up to the 2007-2008 financial crisis. Apparently people are noticing the issue sooner this time and, in response, have sold their stock in Chinese banks to reduce their risks (thus driving down the P/E ratios referred to in the article). As for Russian Energy companies, I just cannot get over the authors rationale for buying. He says, “As for the other value play, Russian energy companies, they trade at similar and in some cases, even more depressed prices, i.e., approximate average price-to-earnings ratios of 4, and price-to-book ratios of 0.60. Sure, there is a degree of corruption risk, but then that doesn’t seem to hold off investors buying Philippine or Indonesian stocks at about four times the price”. The author summarized: Russian Energy companies are a good buy because they trade at low earnings and book ratios and the corruption in Russia is just as bad as some other countries. Solid. My short-but-sweet two sense on Russian Energy (Gazprom in specific) is that Europe gets about 25% of their natural gas from Russia. Ukraine is currently in talks with Slovakia to provide natural gas to the country should Russia disrupt the supply. The United States is also more than capable of shipping LNG to supply the 25% shortfall in Europe should Russia continue to cause problems – the US Congress would just have to approve it. If our politicians are serious enough about cracking down on Russia, this outcome is a strong possibility. What’s the outcome of this? The Russian energy industry is screwed, and minimally higher natural gas prices for Americans (about $1 per thousand cubic feet based on my research earlier this semester). I don’t think I’ve ever read an article that made less sense than what Mr. Martin Hennecke has just written. He rationalizes buying extremely risky stocks by saying they trade at “historically low ratios”. Keep in mind that this is right after he belittles investors for piling into funds due to their “past performance” (which obviously don’t guarantee future results). This is very frustrating for me – a solid investing plan should be based off of more than just a couple ratios. They are certainly an important part of the “big picture”, but nevertheless not the entire picture. Moral of the story is this guy is a joke. I don’t know anything about “The Henley Group Limited”, but I wouldn’t hire this guy as a middle-school finance club advisor let alone the “Chief Economist” of my company. This is the catch-22 of financial news… the only people that I want to listen to are the ones who aren’t talking. The people who are smart enough to know what they’re talking about are making money in hedge funds, not running their mouths on air so that they can write “regular guest on CNBC and Bloomberg” on their article’s “about me” blurb. Ridiculous recommendations are what keep these guys on the air. After all, what’s so interesting about hearing “I think equities are going to remain flat for the year, and markets are fairly priced.”? These guys love it when hell breaks loose and they can make comments like “x company is going to zero” or “buy stock in the worst companies on earth. "What are your thoughts on Hecla Mining (HL)? I bought it at $2.98 and I'm curious how long you feel I should hold it." The first thing you want to notice for Hecla Mining is its correlation to a specific index (this part is relatively obvious, but nevertheless important to the price performance of Hecla). As seen by the price below, the stock (blue line) follows the prices of gold (orange line) and silver (red line) much more closely than the S&P 500 index (green line). I would estimate that, at least in the short- to medium-term, 80-90% of Hecla’s price performance will be due to the price performance of gold and silver. With inflation at historical lows and worldwide economic concerns dampening, the appeal of gold among investors is minimal. The remainder of this report will follow the 10-20% of value that the company provides aside from the direct prices of gold and silver. Hecla’s company projected 2014 silver production is 9.5 to 10 million ounces and 180k ounces of gold. This equates to between $185 million and $195 million in base silver revenue and over $231 million in base gold revenue (based on current market prices). These numbers alone total between $416 and $426 in revenue. However, the analyst-estimated total revenue for the current year (2014) is about $506 million. This difference comes from what Hecla calls “by-product credits”. Hecla (and other miners) realize by-product credits when they mine something they didn’t consider to be their primary target. This can be copper, zinc, lead, or even gold. They then deduct the sales value of the by-product from the cost of mining their primary target (in this case, silver), to get their cash cost of mining after by-product credits. Because these by-products are commodities, their values (and in effect the company’s forward revenue estimates) can be computed with relative ease. I calculated that the correlation coefficient (Pearson’s r) between the by-product credit and the average annual price of copper to be 0.77. Knowing this (and that copper is the largest by-product of silver mining), we see that a significant portion of Hecla’s revenue will come from the price of copper. 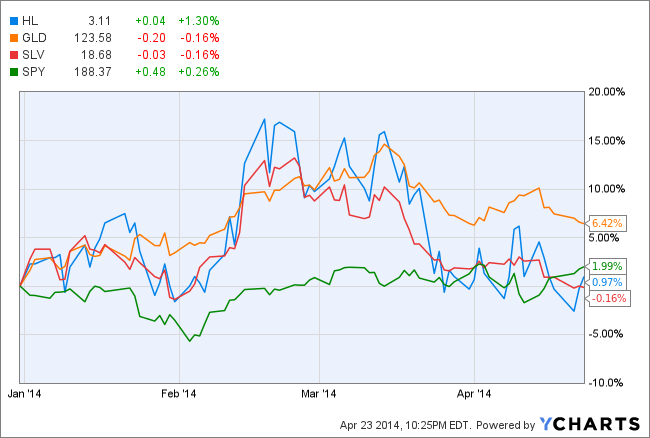 Given copper’s YTD performance, that’s bad news for Hecla. Based on the chart above, the demand industries are flagging, the key economic drivers are unfavorable, and supply industry prices are increasing. This is the picture any analyst will see when they look at Hecla or any similar gold/silver mining company. So, given this information, is the company trading at attractive valuations to be considered a “cheap” buy? Based on its 3-year average P/S ratio and current sales (revenue) per share of 1.19, the stock is trading at a 30% discount. However, when compared to other companies within the same industry, Hecla trades at a significant premium. 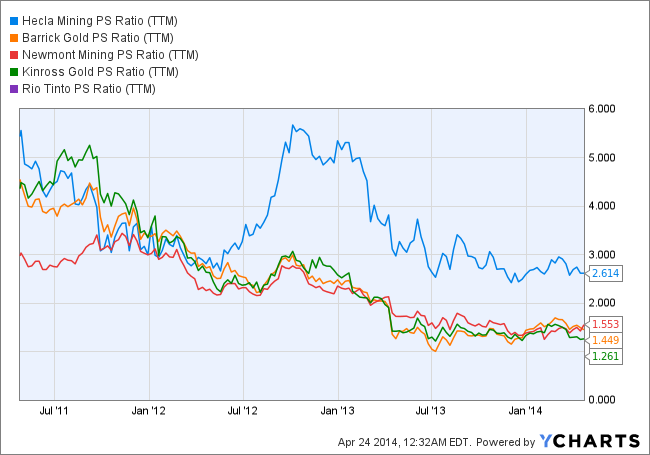 The P/S ratios of Hecla and other companies within the industry diverged starting in May 2012. However, the P/S ratios have begun to converge again starting at the beginning of last year, possibly suggesting diminished stock performance even with above-average earnings reports. Hecla Mining Company’s YTD underperformance versus gold prices and slight outperformance versus silver prices gives a mixed message, especially when compared to other companies within the industry. For short-term trading, it is best to buy HL when the stock is trading at a significant discount to the 3-month price performance of both gold and silver. For longer-term investing, I recommend selling HL as its valuation continues to come back in-line with the industry average of paying about $1.50 for each dollar of sales (P/S ratio). If you’re looking for exposure to the possible recovery of gold/silver miners, I would look to Barrick, Goldcorp or Newmont. If you’re simply looking for exposure to the possible recovery of gold or silver, buy a gold or silver ETF (GLD or SLV, respectively). Are closed-end bond funds trading at enough of a discount to be worth your investment? "My financial adviser recommended a closed-end municipal bond fund (VPV) that currently pays a 7% 'dividend'. He noted that it is currently trading at a 15% discount and it's losses last year were attributed to changing federal interest rates and exposure to the Puerto Rican bond market. What are your thoughts?" The Invesco Pennsylvania Value Municipal Income Trust (VPV) is a closed-end mutual fund that provides tax-free income for PA resident investors. To understand if this is a good potential investment, it is first important to note the difference between a closed-end mutual fund and the more popular open-end mutual fund. Although there is only a one-word difference between the two options, they are quite different. Closed-end funds actually pre-date the open-end funds, and rely on an initial public offering (IPO) where a set number of shares at a specific price are sold to investors. Most of the time, investors have the opportunity to sell these investments on an exchange (such as the NASDAQ) much like a stock. Unlike an open-end fund, which trades at its net asset value (NAV), the price of a closed-end fund can vary based on the traditional forces that effect any stock (supply/demand/value of firm’s holdings). Therefore, when you are buying shares of a closed-end fund, you are actually purchasing a previous investor’s shares as opposed to simply “adding your money to the pot”. This makes closed-end funds inherently more complicated due to additional market forces that effect its price. The fact that closed-end funds are able to trade at a significant discount to their total portfolio value is not well understood in the financial industry (and especially by me), but is also not sufficient reasoning to purchase an “undervalued” fund. The explanation for this mispricing uncertainty is simple – a well-off investor of a closed-end fund could buy enough of the shares (at the discounted price) and force the fund manager to liquidate the assets at the higher market price – thus resulting in a healthy profit for the well-off investor (whose profit would be the difference between the market value of the fund’s assets and the price he/she paid for the shares). So how much of a discount is necessary for an investment to be considered “safe”? That depends, but famed investor Benjamin Graham claimed that an investor can hardly go wrong by buying such a fund with a 15% discount. Because individual funds tend to always trade at either a discount or premium, it makes more sense to look at the fund’s 1-year Z-statistic as opposed to its pure discount rate. This statistic is used to compare a fund’s average discount or premium to its current discount or premium. Keep in mind that this can be misleading because it is essentially a percentage of a percentage. So if a fund trades at a 1-year average of 1% below its NAV and its currently trading at a 2% discount to its NAV, it would be trading at a 100% discount to its average discount – pretty misleading, right? The current 1-year Z-statistic for VPV is -0.15 and is most likely the number your financial advisor referenced. The fund is actually only trading at a 7.53% discount to its market value (based on the NAV calculation on 01/24/2014). This compares to its 6-month average discount of 8.51% and 3-year average discount of 3.26%. The majority of closed-end bond funds are currently trading at significant discounts to their averages due to the poor outlook of the bond markets. Keep in mind that bond investors profit from 2 things: price appreciation (the value of the bond rising or falling) and coupon payments (a.k.a. dividends). Price appreciation or depreciation does not matter at all, whatsoever, to investors who hold the bond to maturity. However, 0% of fund managers do this (at least to my knowledge). This is because they want to sell a specific issue based on changing market conditions. For example, a fund may sell bond X paying a 3.5% coupon in favor of bond Y which pays a 5% coupon. Everything else equal, any investor would choose the 5% bond above the 3.5% bond, so the fund sells bond X at a discount to its purchase price (at a loss). This is the basic reasoning behind the poor state of the bond market today – market interest rates are rising due to the Fed’s tapering of their Quantitative Easing program. This causes current bond prices to decrease as they become less favorable than new bond issues. One benefit of closed-end funds is the ability of the fund managers to utilize leverage. Financial leverage is best described using a comparison I got from one of my finance professors – financial leverage is like alcohol; it makes the good times better and the bad times worse. 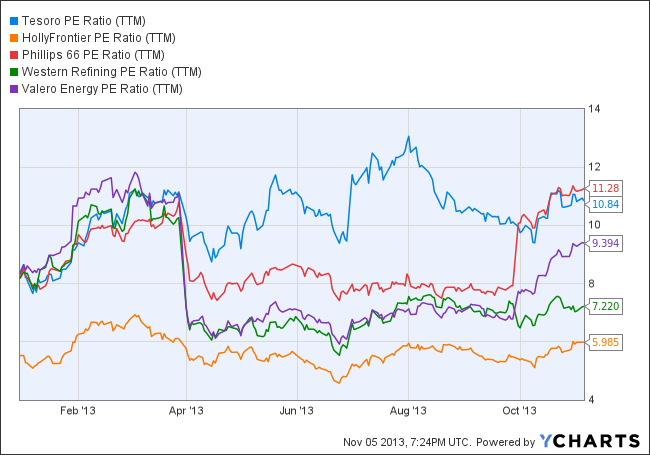 VPV’s gains or losses will be magnified by its relatively-high 38.83% leverage ratio. This means that for every $1,000 the fund uses of its own money, it borrows $388.30. Another important part of any mutual fund is expense ratio. The current total expense ratio reported by the fund is 1.59% – higher than all 9 of the other funds in a 10-fund peer group made up of municipal-bond single state funds (BFO, BJZ, CMF, NCA, PCK, PCQ, NUC, NCO, NXC, VPV) (not all from PA). This is a little concerning considering it also had the lowest 1-year return versus the same 10-fund group. The 7.11% annual distribution is calculated by dividing the last share price $12.65 by the annual distribution amount ($0.075 per month x 12 months in a year). As mention under the “State of the Bond Market Today” section, the fund has 2 sources to pay this 7.11% “dividend” – price appreciation and coupon payments. Because the weighted average coupon rate of the individual bonds in the fund is only 5.64%, this distribution is only sustainable through price appreciation (a feat nearly impossible in this market). Therefore, in a best-case scenario, I would view the $0.075 monthly distribution as a perpetuity and discount it as such. This is because the fund managers will be unlikely to increase this distribution due to current market conditions, and also because the distribution has remained the same since at least 2010 (that is as far back as I can see). At its current price of $12.65 and current annual distribution of $0.90, the Invesco PA Value Muni closed-end fund appears attractive with its 7.11% distribution rate (yield). While the $0.90 is likely to remain the same over the next few years, expect the fund’s price to drop as the Fed continues to taper its QE program. If you are looking for a high-dividend paying investment, I would recommend a relatively-safe/high dividend-paying stock such as Seadrill (SDRL), a real estate investment trust (REIT), or possibly another closed-end PA muni fund. However, if you do choose to invest in VPV, ensure that your distribution preference is set to “cash distribution” as opposed to “reinvest distribution”. The latter is generally the default option, but for this fund you will want to get the payout in cash as opposed to additional shares. "Medbox stock has skyrocketed into the New Year and I was hoping you could give me insight on to why that is and if it is a viable long-term investment holding. Because it is a "marijuana" stock, I would assume most of its success its attributed to Colorado's new recreational use law. What are your thoughts?" The Marijuana debate has officially tipped in favor of its users. Starting on January 1st, 2014, Colorado residents were officially allowed to purchase up to one ounce of marijuana for recreational purposes. And possibly most importantly – between the long lines at dispensaries, product shortages, and cold temperatures – the transition was incident free. I, for one, have no interest in smoking the drug regardless of its legal status, but think it will be a fantastic source of tax revenue for the government (25%+ in Colorado) and great source of legal profits (which will be taken from violent drug cartels and gangs). For the first time, Americans favor legalizing marijuana. 58% now say the drug should be legalized, with 39% saying it should remain illegal. As long as this trend continues, public opinion will push the government to continue its acceptance of the drug, resulting in massive profits for dispensaries, growers, accessory-makers, and others involved in the industry. From a “macro” perspective – marijuana is a high growth industry with lots of potential for massive returns over the next 5 to 7 years. The first thing that needs to be mentioned regarding Medbox, Inc. is that it is HUGELY volatile. Over the last 18 months, the stock has been trading as high as $205 and as low as $2. If the stock follows a trend similar to that of January 2013, it will pop then drop again. In December 2012, the stock went from the low $20 range to a high of $98 on January 11th, only to return to the $20 to $30 for the rest of the year. Recently, the stock continued its December 2012-like climb in December 2013, only to continue into the New Year. Medbox essentially produces highly secure “vending machines” for the “alternative medicine industry”. What makes the company’s core product (the “Medbox Machine”) confusing is that it is only intended to be used by the clinic employee/pharmacy/nurse as opposed to directly to the end-consumer. I suppose I was expecting more of a Redbox-style user interaction than asking an employee to interact with the machine for me. The company does not directly hold any patents (according to the website), but holds rights to 5 patents through an “affiliate entity” – a euphemism meaning they bought the licensing rights for these patents from a different company. I think the company has potential in the long-term, but marijuana dispensaries that start up in recently legalized states will most likely focus their expenditures on building inventory – not high-cost vending machines. This is a very thinly traded stock only available in the OTC markets (if you’re not familiar – OTC is everything that doesn’t trade on a major exchange – including penny stocks). This means that it may be hard to buy or sell a large position in one day. Based on the current share price and average 3-month trading volume, less than $1.7 million worth of shares change hands every day. Compare that to over $6 billion for Apple and over $43 million for AutoNation (one of the smallest companies in the S&P 500). In my opinion, this is a pure momentum play. The money to be made here is in the very short-term (holding time should be measured in hours, not days). This is a buy high, sell higher scenario. If that’s your style, this is the opportunity for you. I would recommend choosing a dollar amount that represents the maximum you could fathom losing. Then invest twice that amount. Don’t pay more than $50 a share for the company, and set a limit sell order around $75 to automatically sell your position at that price or higher. I do not recommend holding onto it for more than a week, and definitely sell before they report earnings at the end of the month. An interview with the CEO of a company can either make or break my opinion of the stock. There are many great companies with great CEOs that have performed extremely well in the market last year – Boeing’s McNerney, Berkshire’s Buffett, P&G’s Lafley, Goldman’s Blankfein, and Sprint’s Hesse to name a few. I have seen all 5 of these CEOs speak and have been nothing but impressed with each: a clear vision for the company, implementing meaningful changes, a clear understanding of their business and where it is headed, etc. I watched a few YouTube videos of Medbox’s CEO speak, and while he appears to know what he’s talking about, when he was questioned on the performance of Medbox, he appeared uneasy and began stuttering and started looking off the screen. I suppose it’s important to note that OTC companies have much more laid-back reporting requirements than NASDAQ or NYSE components. Maybe it’s just me, but I don’t trust the guy – especially when he tries to make it sound like they developed the patents when they simply license them from a different company. However, the dependability and trustworthiness of a CEO is not really a factor when it comes to short-term momentum trading, so take this with a grain of salt. Covered calls are dead, or are they? "I was recently introduced to the concept of the covered call strategy, and it seems to make a lot of sense. However, after researching the strategy more in-depth, it appears that it doesn't generally work well. Why is this? And what can I do to earn income on my current holdings?" So if this is such a great concept, why doesn’t everyone use it? The covered call strategy has been ill-employed in the past, causing poor performance, followed by a general disinterest in selling covered calls. This is most likely because, in the past, the strategy was to sell options with a strike price x% higher than the current market value of the stock. Unfortunately, this strategy does not take into account the volatility of the stock. For example, selling a monthly call option for Coca-Cola (low volatility stock) that is 5% higher than the market price will most likely net next to nothing since the chances of Coca-Cola growing 5% in one month are extremely low. Conversely, selling a monthly call option 5% higher than the market price for high volatility stocks such as Tesla or Questcor Pharmaceuticals isn’t unreasonable. So what is the best way to take implied volatility into account when selling call options? Instead of setting the strike price as a percentage of the market price, choose a percentage return you would like to receive on your option sales (say 1% for monthly options). Then find the call option with a “bid” price closest to this number. For example, if XYZ stock is trading at $100 and you want to earn 1% on this monthly option sale, choose the strike that has a “bid” value of $1 ($100x1%=$1). Once you decide what strike price you would like to sell against your holdings, take a look at the MACD and Bollinger Band charts of the underlying stock. The best time to sell a call option is when the price is approaching the upper band of the Bollinger Band and the MACD line is decreasing (momentum slowing, possible reversal coming). This will allow you to get paid the highest premium for your stock holding, with the greatest possibility that it will drop in value in the near future (remember: drop in option value = gain for you). "Can you recommend some non-traditional mutual funds or ETFs? I'm looking for something that deviates from the usual market capitalization/value-growth funds that dominate the available offerings." "I'm thinking of making a big play on HollyFrontier Corporation before their Q3 2013 earnings report on November 6th. More than 5,700 November 48 call options were purchased on Friday, showing traders turning bullish on the company. What are your thoughts?" Two things I would like to point out before I get too in-depth with this analysis. First of all, one of the most important inputs in the profitability of oil refiners is the price of oil. As you can see from Figure 1, the price of oil during July 2013 to September 2013 (the quarter the company is reporting for) is the highest it has been all year. This is certainly a good sign for HollyFrontier, as its profitability has fallen behind its peers in recent quarters. Companies with shrinking margins tend to trade at higher price-to-sales ratios and lower price-to-earnings ratios than those of their peers. This is reflected in the PE ratio of oil refiners, where HollyFrontier has the lowest ratio versus its peers (showing an underpricing in the company’s stock – see Figure 2), and is also reflected in the PS ratio, where HollyFrontier has the highest PS ratio versus its peers (showing an overpricing in the company’s stock – see Figure 3). The downside to the company is that investors take into account the present value of all future cash flows when pricing a stock, and the price of crude oil has fell from over $110 per barrel in September to $93.39 today – not a good sign for the company’s bottom line for the 4Q2013 reporting. The second perspective that is important to mention is, historically, high option volume (whether it is puts or calls) does not indicate direction of a stock following its earnings report. Two recent examples were Apple, Inc.’s quarterly earnings released last week that were preceded by high call option volume. Before the report, the stock was trading at $529.88 versus $526.85 (keep in mind that the actual EPS of $8.26 was higher than analyst estimates of $7.96 – it was the outlook that was less than promising). I have a feeling that HollyFrontier may follow this same trend – great returns for 3Q2013, but negative forward-looking prospects. The second example is stock in Sprint Corporation. The earnings report came in worse than expected based on subscriber losses throughout 3Q2013, but a positive outlook going forward. This has propelled the stock from $6.70 before its 3Q3013 earnings release on October 30th to $7.20 today (a 7.24% increase). It’s also important to note that put option volume in the week before its earnings release was over 3 times call option volume. I certainly wouldn’t rule out HollyFrontier as a long-term acquisition, but I definitely wouldn’t use high call option volume as a core reasoning for purchasing stock in the company ahead of an earnings report. The stock has seen virtually no net price change from the beginning of the year (-0.11%), while its PE and PS ratios have stayed mostly stable as well. Two of HollyFrontier’s competitors underperformed analyst EPS estimates for 3Q2013 (Phillips 66 was 7.4% lower than expected and Western Refining, Inc. was 35.3% lower than expected). None of the companies mentioned in the charts below increased more than 4% since the earnings release (Valero Energy Corporation increased less than 1% after its EPS for 3Q2013 came in 39% higher than analysts’ expectations. I cannot make a recommendation on the short-term trading prospects of HollyFrontier. There are multiple analysts who follow these stocks on a daily basis and are still only right 50% of the time on quarterly earnings. However, with an impressive earnings yield (18.8%), FCF yield (19.32%), book to market ratio (0.7321), dividend yield (2.58%), and reasonable PS ratio (0.4204), this is a reasonable value pick that will perform as a long-term holding. Click to check out our Twitter feed! © 2014 Sargent Capital. All Rights Reserved.